As always, we try to keep parents in the loop about all things iPad. That doesn’t simply encompass apps, either! How you store and protect your iPad is just as important as what you download on it, especially if there are little hands involved. Nothing beats a solid, kid-friendly iPad case that puts your mind at ease, even when you hear it hit the floor. That said, meet Widge, a brand new child-friendly iPad case from X-Doria. 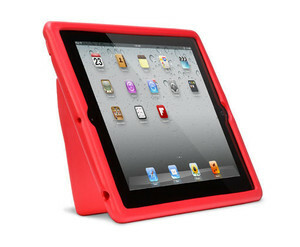 Vibrant and bright red, the Widge has only one thing in mind: keeping your iPad safe from your kid while being fun and hassle-free! Lot’s of iPad cases have moving part like screen flaps, kickstands, etc. While they may be geared toward children, sometimes moving parts might be a little bit much for younger children and no parent wants to deal with the perpetual wailing of “Mommmmmm! Set up the iPad case so I can watch WUBBZY, PWEASSSSE!” Yes, you love your kids, but that gets old. Fast. With the Widge from X-Doria, there are no moving parts, just a streamlined, soft case with an innovative “wedge” attached to the back. Because of the wedge design, the case can stand up for movie or video watching, anytime and anywhere, without help from a parent. Coming in at $50, the Widge may seem a little pricier than other iPad cases you have seen, but it is likely worth the extra money to avoid the hassle of continually propping the iPad. Protection is also a very important consideration when purchasing a new iPad case and the Widge doesn’t skimp there, either! The soft, bouncy foam plastic wraps all the way around to the front of the display to provide ultimate protection from drops, spills and sticky hands. Click here to pick up the new Widge iPad case by X-Doria for $50.